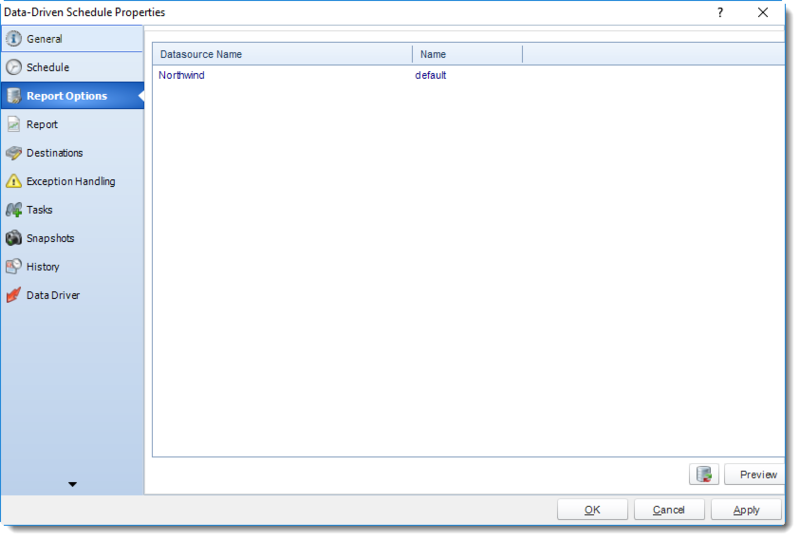 How do I use Data-Driven Schedules for SSRS in SQL-RD? A data-driven schedule allows you to drive all variables of your reporting requirements (parameters, destinations, output formats, etc.) from database tables and queries at run time. A data-driven schedule allows you to drive all variables of your reporting requirements (parameters, destinations, output formats, etc.) from database tables and queries at run time. You can also use static text and default values should you wish. You can use Data Driven schedules for a number of scenarios. 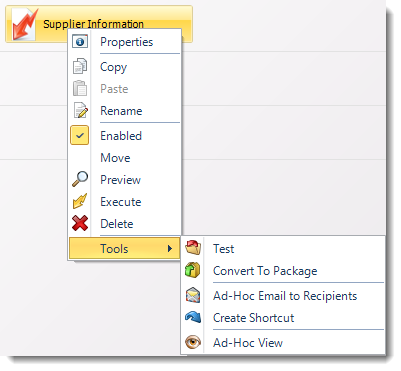 Distribute a report to a fluctuating list of recipients. For example, you can distribute a report throughout a large organization where recipients vary from one month to the next, or use other criteria that determines group membership from an existing set of users. E.g. select * from mytable where firstname = ‘john’ will generate the report and distribute only for records where the recipient’s first name is John. 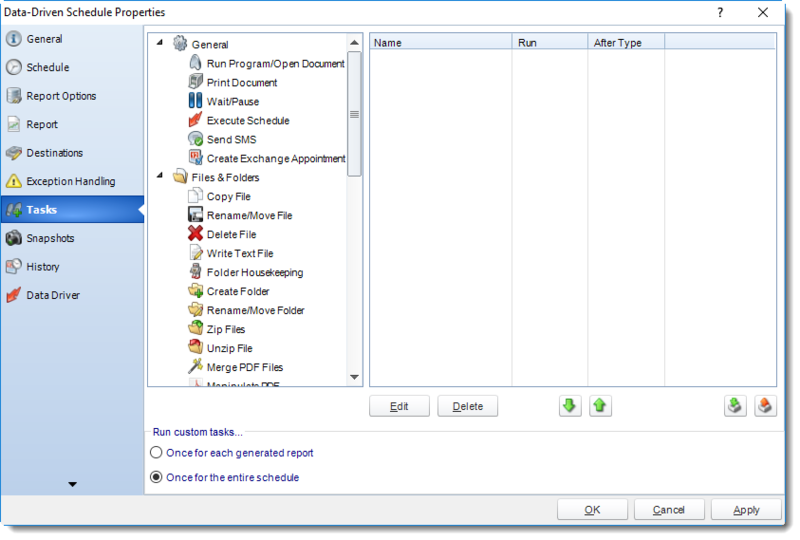 Filter the report output using report parameter values that are retrieved at run time. For example, the parameter value returned from the table for Last Name will be “Doe” for John Doe and “Smith” for John Smith. 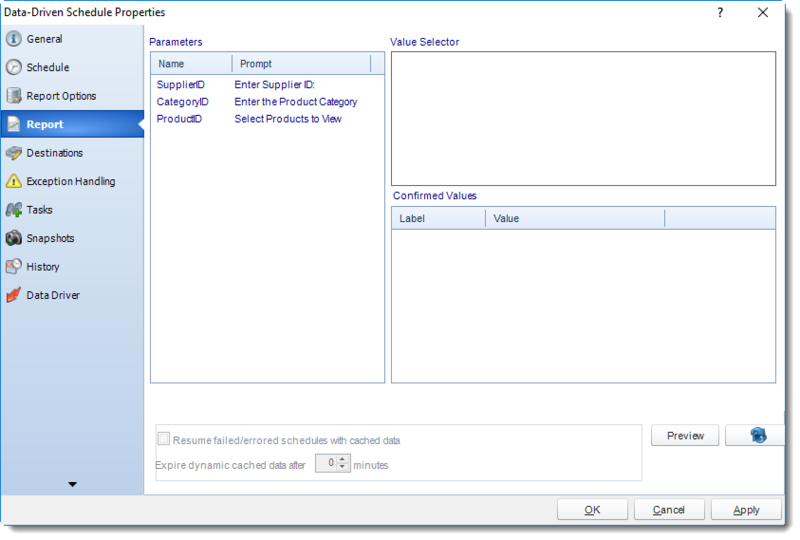 Determine the delivery type and report format dynamically at run time. 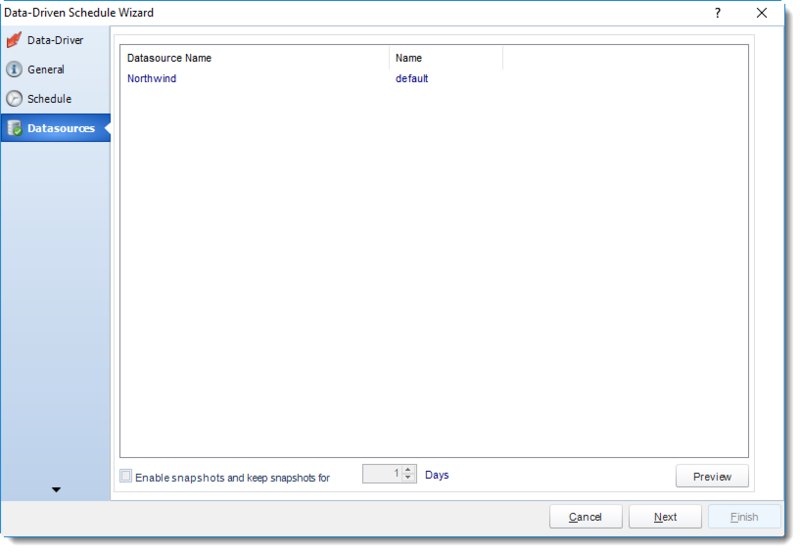 For example, John Smith gets the report as a PDF file by email with a customized email body and John Doe gets the report as an excel spreadsheet by FTP upload to his web server. The following simple example will illustrate the process of creating a Data-Driven Schedule. You need to have the report run once for each record. 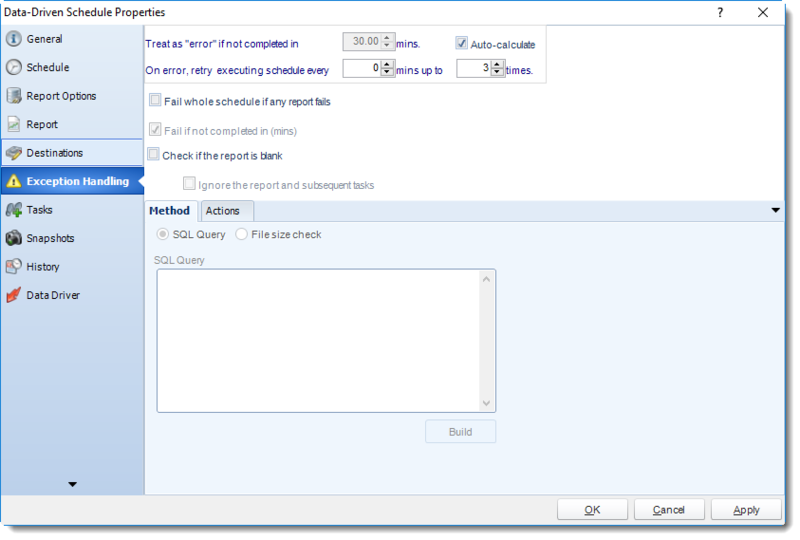 The parameter values entered in the table above should populate the parameters in the report and the report should be delivered to the destinations shown in the table. John Doe will receive only one email for the reports from sectors 1 and 3. He will also get the reports from sectors 2, 3 and 34 delivered to his reports disk location. Peter Crimble will have his report printed on the Printer he specified. Jorge Minola will have a copy of his report sent to John Doe to the disk location he specified and a copy uploaded to his FTP server and folder. Anil Maharaja will receive an email as requested. John Wu will have his report delivered to his email and FTP server as requested. 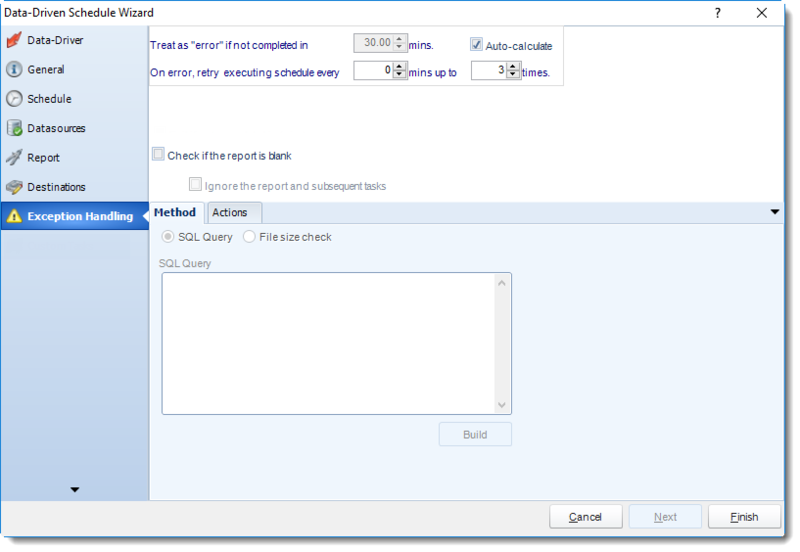 Note that as the data changes in the database to reflect the requirements, the reports will be delivered as necessary without requiring any changes to the schedule in SQL-RD. Using a Data Driven schedule SQL-RD will reel through the database table and generate and deliver a report for each record using the information provided. How do I create Data-Driven Schedule for SSRS? The Data Driver is where you set up the source for data for your data driven reports. If your data source or data selection criteria changes this is where you will need to make any required changes. 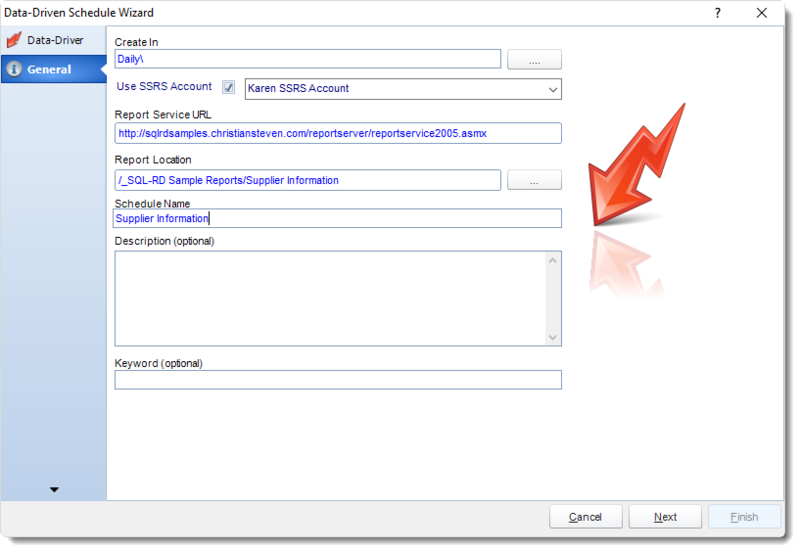 ODBC DSN Name: Drop down and select a DSN. Connect: Click Connect to connect to the Database. Select the table from the database that holds the required data. You can refine your selection query by using the simple or advanced tabs. 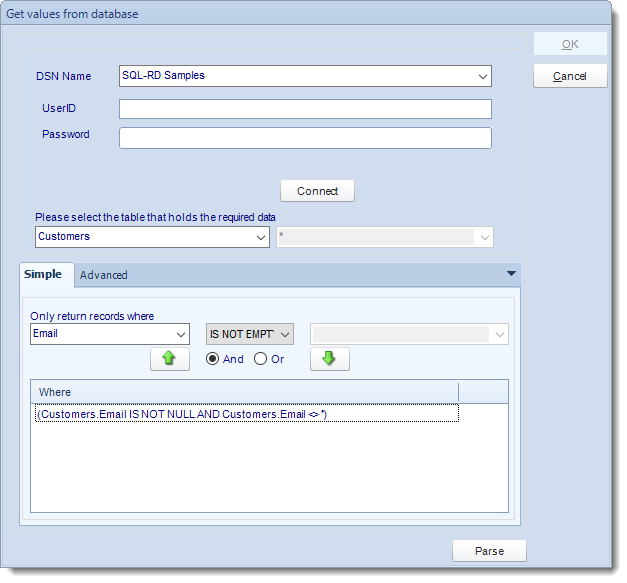 For more information of "Get Values From Database" interface, click here. 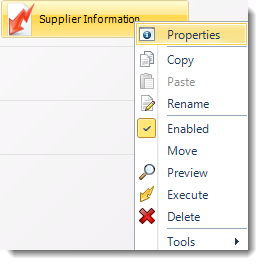 Click Build to specify the data selection criteria. This will return you to the Build Data Driver tool. 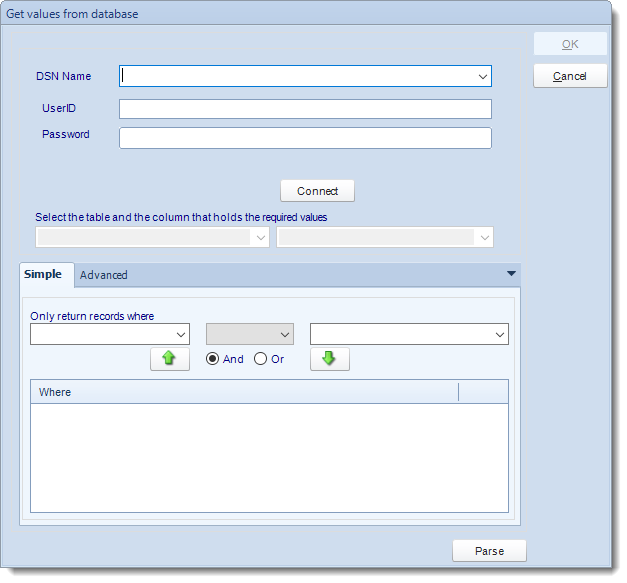 Key Column: Select the key column for the data that is returned for the reports. The information that drives the schedule is required to have a key column so that each row in the table is uniquely identified by the value in this column. The key column is there as an identifier which is used to troubleshoot in cases where there is a problem with one of the records. 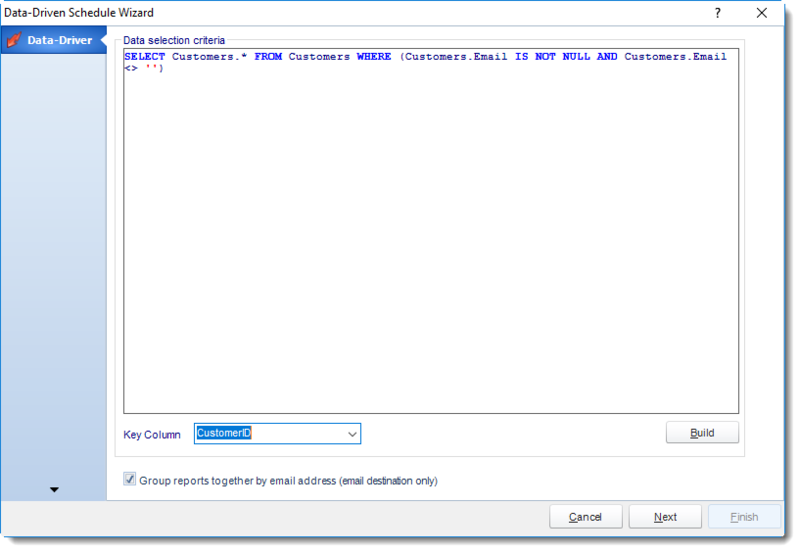 Group reports by email address: You can instruct SQL-RD to group reports that are sent to the same email address. Please note that enabling this option disables the ability to embed the reports in the email body for email destinations. 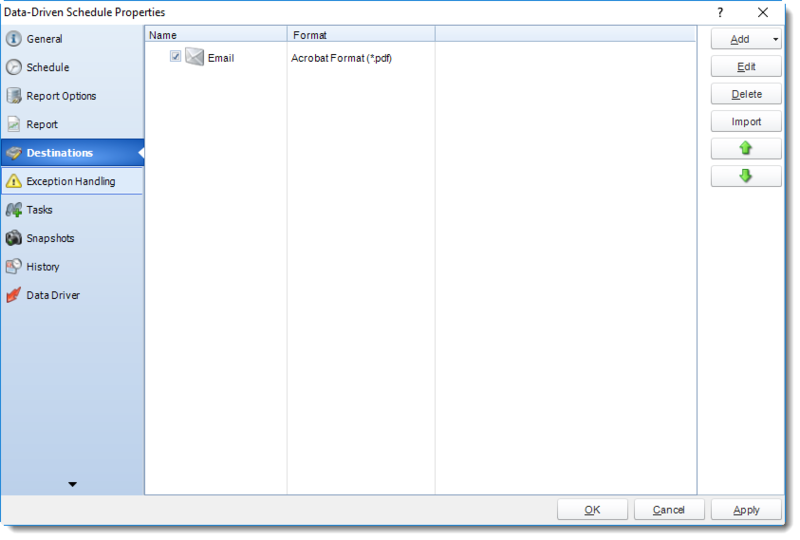 Create in: The SQL-RD folder where the schedule is stored. Schedule Name: The name of the schedule. 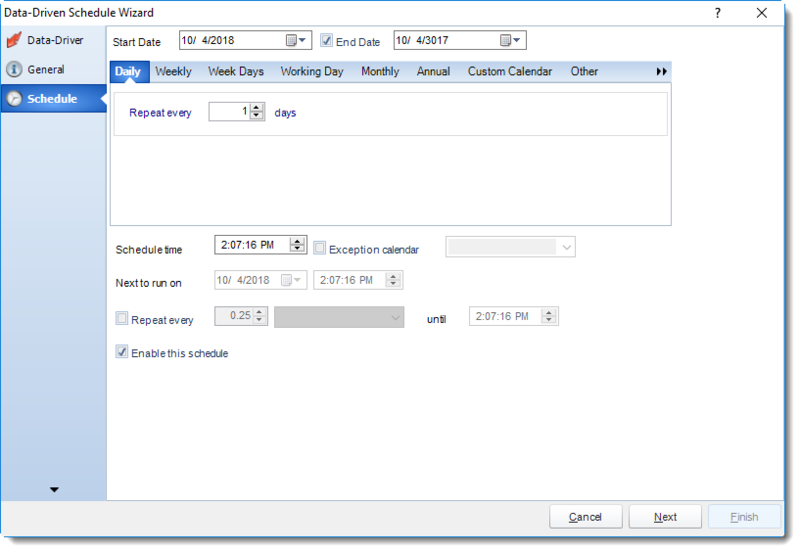 Keyword (optional): Enter some keywords which can be used later by Smart Folders to identify this schedule. 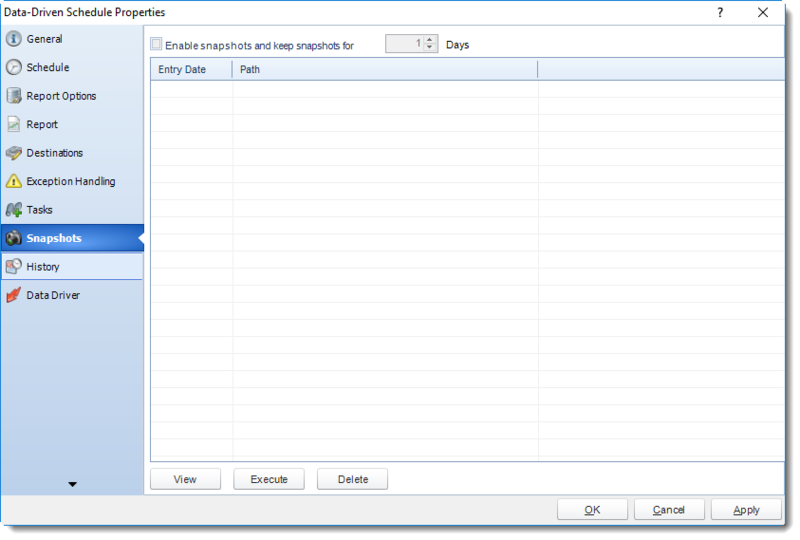 Enable Snapshots and keep snapshot for X Days: Save a Picture of the report as it is produced. 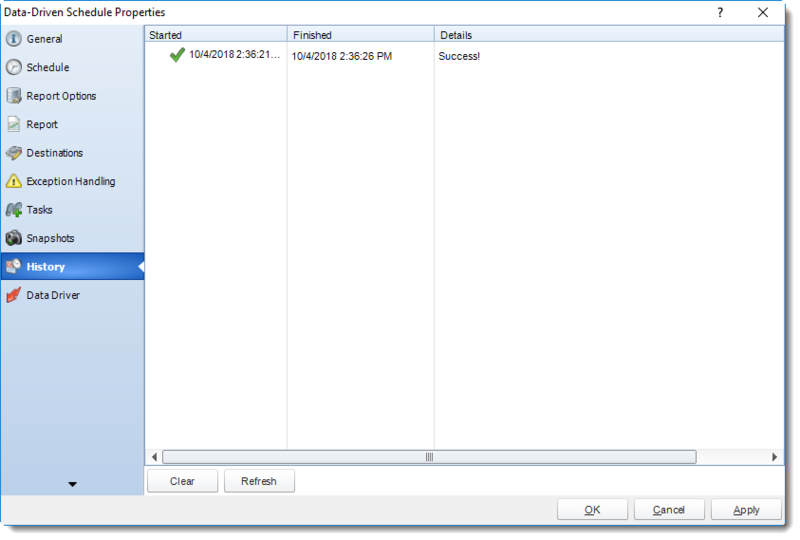 Choose the amount of time will be stored in the system before deletion. 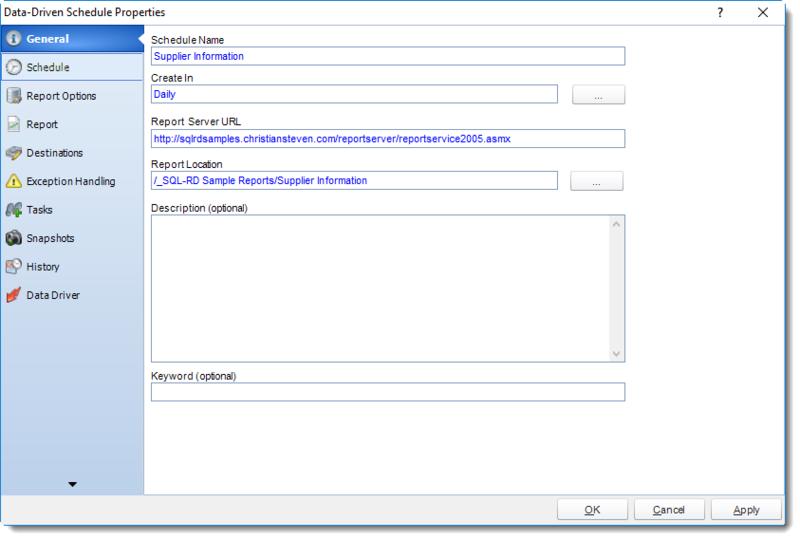 For each parameter, select from the drop down list the value the report must use. In a single schedule, only one parameter value can be run at a time per parameter. You can type a value into the field, or drag and drop an "insert". In this section, you will decide where your schedule will be delivered. The list in the center will display the list of destinations you have added to the schedule. You can organize the various destinations’ order by clicking on the green up and down arrows. For more information about Type of Destinations, click here. 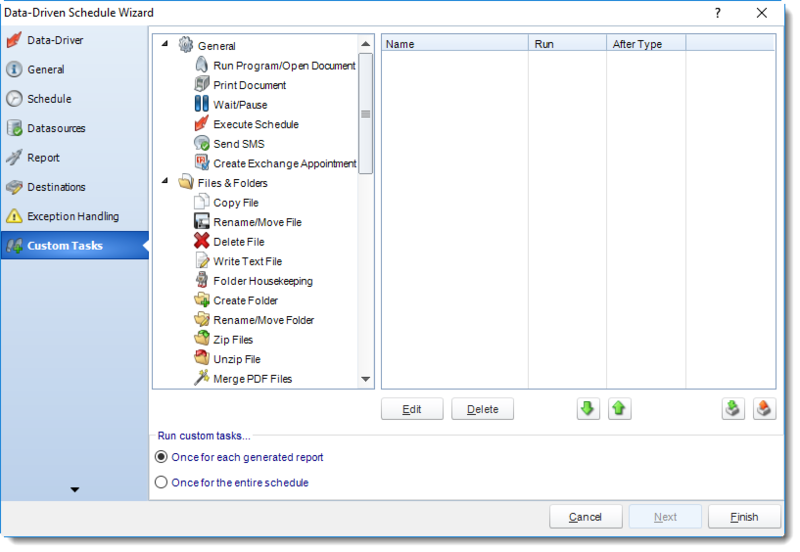 For more information about Output Formats, click here. With the Data Driven Schedule, you can determine the delivery method of your report based on your data. 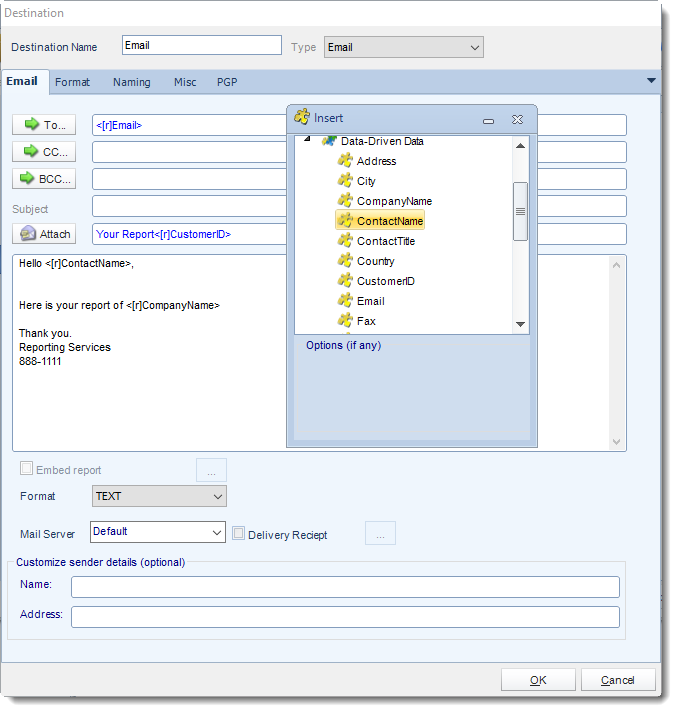 In your table, specify the delivery method by creating a column for each delivery type (FTP, SharePoint, Email etc.). For each record specify their email, fax number, and so on. Tip: For email destinations, simply add a semicolon after an email address to send the same instance of the report to another email address. 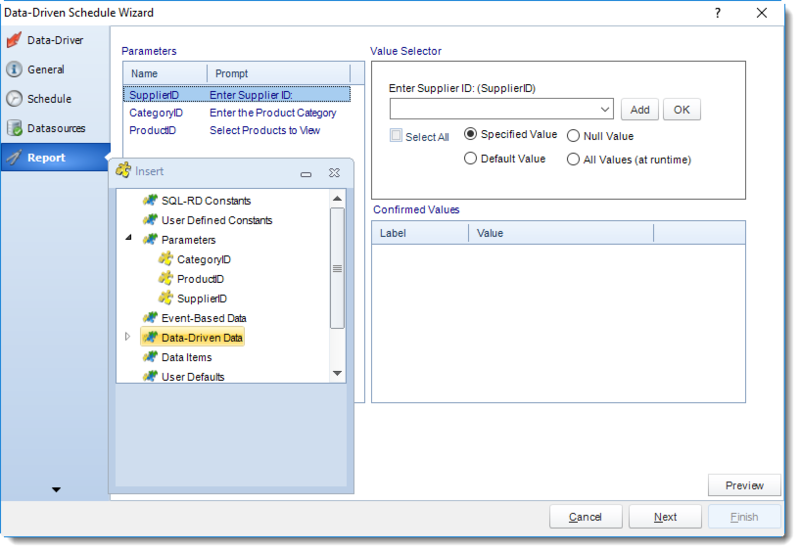 As mentioned above, SQL-RD will pull delivery data from your database. 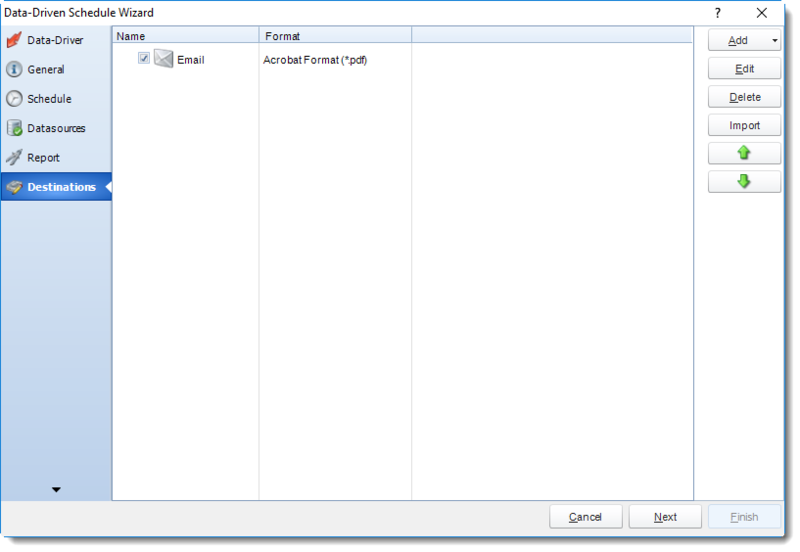 In this example, we will be using email addresses found in the table. With Data Driven inserts, simply drag and drop the field that indicates your desired destination (email in this case). 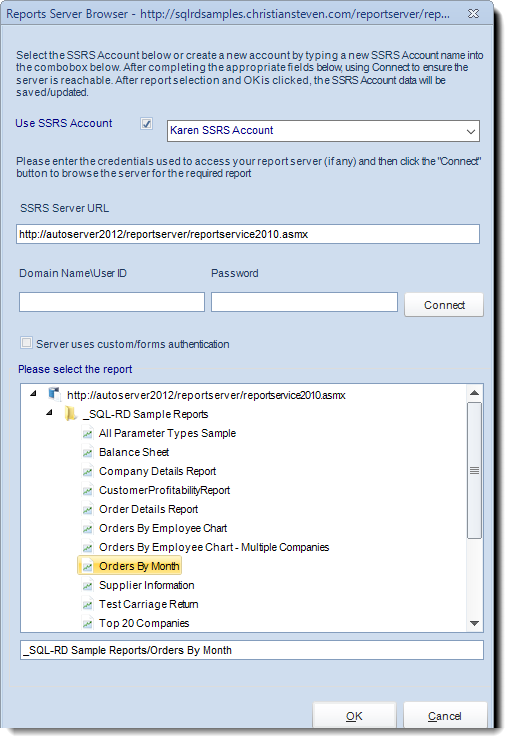 Now SQL-RD will deliver a unique report based base on a corresponding email address. You can also customize the messaging the recipient receives. 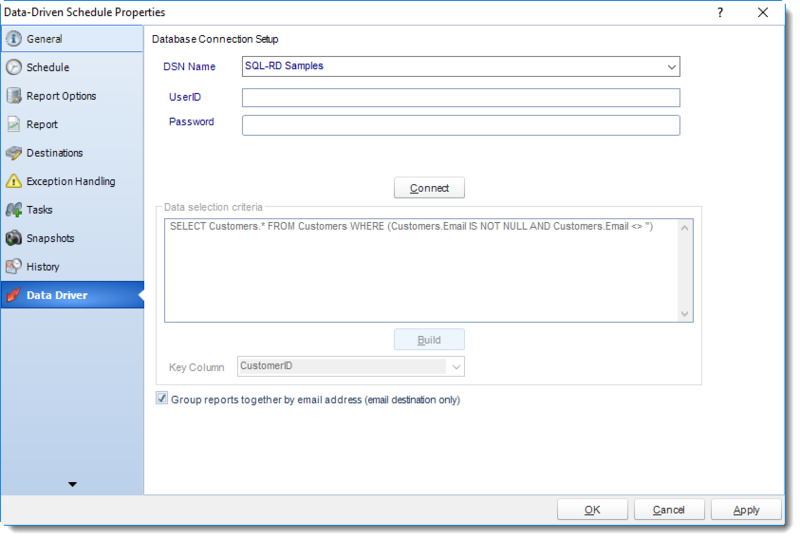 Using Data Driven Inserts, SQL-RD will automatically pull data from your table and use it to customize the subject, body or report format. Simply drag and drop fields from your table to the desired position. 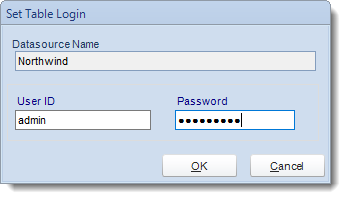 For example, to customize an email greeting, type the greeting, and add the recipients name as shown above. Preview: Preview the report before execution. 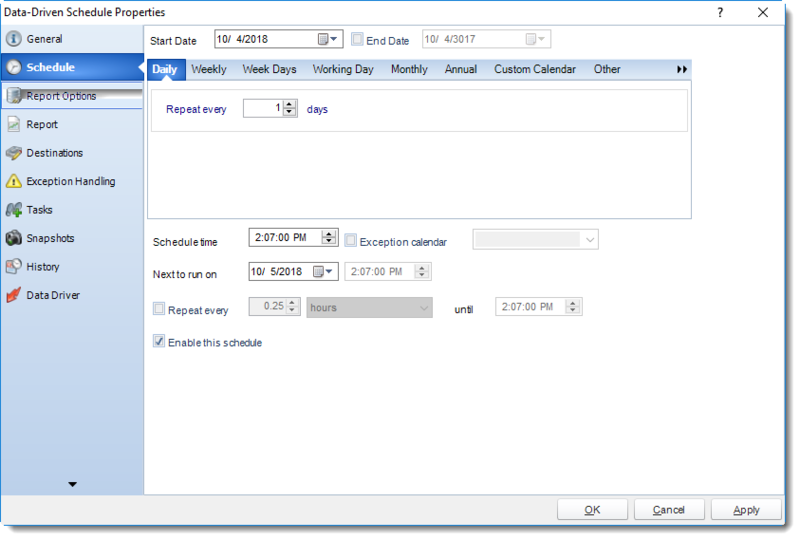 Test: Use this option to test the schedule and export it to selected "test" destinations. Convert To Package: This button will move this report into a package. The package will have the name of the single schedule report. Ad-Hoc View: This button allows you to preview the report.